One of my 'style' resolutions for 2018? MORE COLOR. Lately, I have been drawing inspiration from bold hues + unexpected color mixes. Some of my favorite street style + blogger babes have been doing this for years- and in 2018 I want to test it out. Of course, I am keeping my staple pieces (white tee, blue jeans, black boots). But where can I add a punch color to refresh my tried + true outfit choices? 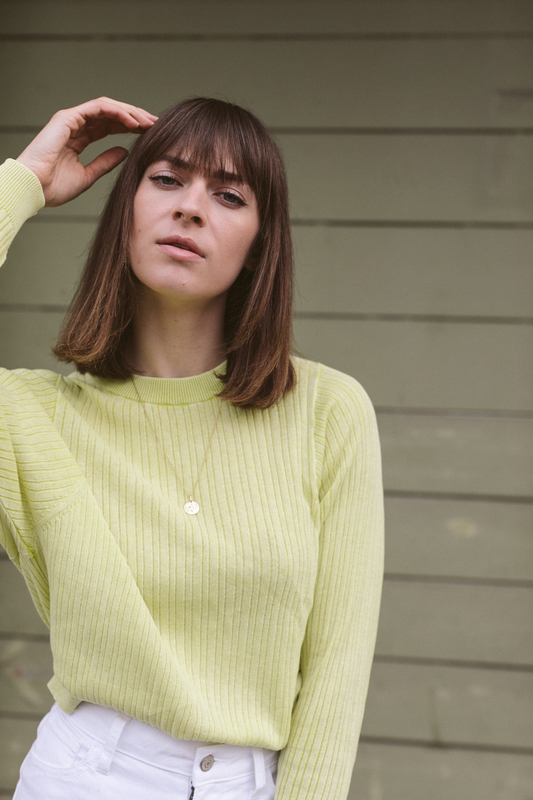 This chartreuse sweater + 'limon' Marais sandals gives me a dose of pigment that feels ultra cool + unpredictable for winter. Wearing white in winter breaks "all the rules" but that's where I want my style to tread. So what colors are on my radar? I am DIGGING the Pantone color of the year- Ultra violet. It was seen all over runways for Spring 2018. I never have worn purple, but excited to add this color to my wardrobe. I am thinking a chunky knit, bold earrings (I am getting my ears re-pierced next week! ), or block heel. I am relieved that millennial pink is getting a break. YES, I adore the shade but a more saturated palette embodies what I want to be in the new year. Other colors? Fire engine red, electric navy blue, and fuschia. Here is a link to my winter pinterest board if you'd like to see more of my inspiration. My newest obsession as well is this patent leather Tory Burch satchel bag. I am obsessed with the structure shape, shiny texture, and gold hardware. It feels vintage, and adds that classic touch to any look. It is big enough to pack my day in it (My camera, notebook, sunglasses.) If you're looking for a bag as a 'working woman', I would definitely invest in this piece. Old Navy wide leg jeans (sold out but similar to here), BP crewneck sweater, Tory Burch Juliette satchel bag, Marais suede sandals.